The following are exerpts from a recent blog article from Journey Online, an award-winning monthly magazine published by the Uniting Church in Queensland since 1986. Dianne Jensen interviewed Robin Mann and wrote a beautiful peice discussing his career that spans over 40 years. The blog was featured under Features > Music for the soul. You can see it here. Robin Mann has been a familiar name to churchgoers for more than 40 years. Dianne Jensen talks to one of Australia’s most successful and prolific songwriters. Contemporary Australian worship owes much to Robin Mann. From the enduring popularity of “Father welcomes all his children” (1973), written for the baptism of his first child, to the haunting “Sorrowing song” (1986), his music has given a fresh, authentically Australian voice to the way we express our faith. More than 100 of Robin’s songs have been published, the largest number in the All Together series from Lutheran Publishing House Openbook. 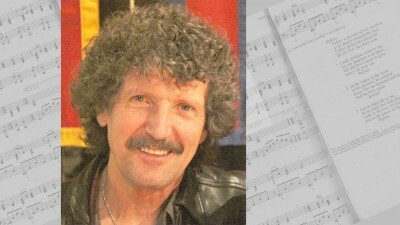 Together in Song II contains eight Robin Mann songs, including “When our life began again” (1980) “Feed us now” (1976) and “A Christmas blessing (may the feet)” (1983), for which he wrote the music. Robin, now 66, and his wife and music partner Dorothy have deep roots in the German Lutheran community in South Australia. They have been singing together since they were teenagers, and continue to be deeply involved in their local St Stephen’s Lutheran Church in Adelaide. Their most recent musical collection is Heroes, songs for children of all ages. “My writing has come out of a combination of folk and early pop, a good deal of hymnody, and certainly Lutheran and probably the Methodist tradition to a degree,” says Robin. “I grew up on the pop of the 50s, I’m the ninth of 11 kids … so the Everly Brothers and Elvis Presley and all that music was very much part of my growing up and influenced everything I’ve written since. The catalyst for Robin’s songwriting career came in 1971, when he and Dorothy joined Kindekrist, arguably Australia’s first Christian rock band. In parallel with the Jesus movement of the 1970s in the United States, Kindekrist sang about social justice and challenged establishment values. The search for contemporary Australian music inspired Robin to begin writing and performing his own songs, which he combined with a teaching career and then chaplaincy and lay ministry before turning to full-time freelance work in 1995. Robin Mann’s distinctive blend of simple, eloquent lyrics and haunting refrains arranged in a less formal style struck a chord with a generation seeking to break away from tradition. “Earlier on I wrote a lot of songs that were to be performed, not for people to sing together. As time went on, the songs that worked for people to sing together became much more the ones that I would write, and that required a different approach,” says Robin. Even older classics such as “Hark, the herald angels sing” are pitched so high that they challenge most people, he adds. Together the Manns have produced a wide range of songs with melodies and lyrics for all seasons of life, many drawing directly on scripture. In comparison to the simple themes of contemporary Pentecostal music, their music reflects the teaching tradition exemplified by the great hymn writers such as Charles Wesley and Isaac Watts. Some of Robin’s most poignant and well-known songs are based on the Psalms, laments he describes as “complaining songs”—such as “Comfort, comfort all my people” (1975) and “Sorrowing song” (1986)—have been used by many churches across Australia in times of national disaster and personal crisis. Robin added extra verses to “Sorrowing song” in 2002 after the Bali bombing. We all have our Robin Mann favourites, with individuals and congregations zeroing in on particular songs that express their theological stance. His most controversial song, “God. Version 1.0” (1991) is not used at all by some Lutherans. The lyrics refer to God as “mother-sister just as much as father-son”, and begin “I don’t believe in a God up in the sky, who sits in heaven and never hears me cry”. Robin’s work as a freelance composer and performer takes him across Australia leading workshops as well as writing, recording and promoting Christian music. In 2013 and 2015 Robin was a presenter and mentor at the Uniting Church in Australia Songwrite national gathering. Many of his most popular songs are available on the Assembly Songs that Unite website. Will coming together in song continue to play an integral part in our worship?